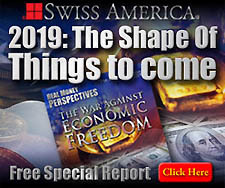 Home Page: SwissAmerica.com's main index page with up to date precious metals and numismatic coin information and commentary. About CRS: Up to date information about Craig R. Smith, Chairman of Swiss America Trading Corporation. Senior Associates: Swiss America's Senior Account Executives with over 10 years experience with the firm. Broker Directory: Listing of Swiss America's Account Executives. About SATC: Background information about America's most trusted gold and silver coin dealer. Contact Us: Online form and real world contact information. Why SATC? : Why choose Swiss America for your precious metals and numismatic purchases? Our Credentials: Swiss America Listing of endorsements, accreditations and associations. Client Testimonials: Watch and read what other clients think about their experience with Swiss America. SATC In The Media: Information about Swiss America and Craig Smith media appearances. Complaints: Information about dealing with coin gold complaints. Employment At SATC: Apply to work with Swiss America. Gold Market News: Geopolitical, Economic & Precious Metals Market Trends, News & Commentary. Real Money Blog: Daily news headlines and market news updates. Gold News Daily podcast: - Latest market news in audio format and text, also sent via email. News Releases: - Latest press releases from Swiss America of interest to the public. Research Reports: Newsletters, research reports and analysis from Swiss America. Browse News Archives: Browse older articles from our Market News and Featured Commentary sections. Enews (un)subscribe: Manage subscriptions for email market news updates. Why Gold Prices Rise: 7 major forces propelling precious metal prices higher. About Numismatics: Educate yourself with this overview of U.S. rare gold and silver coins. Silver Dollars: The silver rush is on, but which type of silver is best? Getting Started: Basic steps to start building a hard asset portfolio. Free Resources: Browse the latest free multimedia educational resources. Avoiding Gold Scams: 5 steps before buying or selling precious metals. Links: Swiss America related web sites and other recommended news and commentary sites. Request Free Resources: Request gold and silver coin education materials be sent to you via regular mail. Login To Your Account: Login to your SwissAmerica.com membership account. Account Overview: An overview of your account information. Modify Account Information: Inform us of any changes to your address or contact information. Account Notifications: Manage your account notifications to be alerted of changes in trading status via email. Trade/Payments Status: Look at your trade and payment status in realtime. View Your Portfolio: See a realtime listing and values of your Swiss America Trading Portfolio. View Trade History: See your trade history and print duplicate invoices. View Receiving History: View your recent history of coins you have sent to us for liquidations. Manage Subscriptions: Manage subscriptions for email market news updates. Change your password: Change your SwissAmerica.com member account password. Link Web/Trading Accounts: Link your online SwissAmerica.com member account with your Swiss America Trading Corp trading account. Retreive Password: Service to recover a lost password for your SwissAmerica.com member account. Retreive Username: Service to recover a lost frogotten username for your SwissAmerica.com member account. Contact Your Broker: Email your broker directly for your SwissAmerica.com member account.